Saturday 1st December 1984 was a bright calm day and myself and Raymond Hume embarked on our monthly bird race to see how many species we could see in a day and we chose Belfast Lough as our destination. By mid-afternoon we had reached 89 species with a Long-tailed Duck Clangula hyemalis off Carrickfergus and Glaucous Gull Larus hyperboreus off Kinnegar the highlights. By Northern Ireland standards or more accurately by our standards this was a great day but we really wanted to get to 90 species. We decided our best tactic was to try the pools at Duncrue Street Marsh where a lurking Ruff Calidris pugnax or Little Gull Hydrocoloeus minutus might be uncovered but realistically a giant Rat or two was more likely! We parked the car and scaled the large gate or rather went round it, always fraught with difficulty because if you fell in the stinky mess it was goodnight Irene! Once that was negotiated successfully we proceeded along the concrete walkway which skirted round the pools. About twenty metres along a sparrow hopped out in front of me and my initial thought was that it was a Dunnock Prunella modularis but once I got it in the bins I realised this was no Dunnock. I called Raymond who was ahead of me and he turned round and I pointed at the bird on the ground just metres away from us both. I didn’t know what it was but Raymond reassuringly said it was an 'American sparrow' but surely not here in Belfast! For next twenty minutes or so both Raymond and myself made notes and drew little doodles, as Willy McDowell called them, and watched this bird at close quarters, it showed no fear. A mean looking man with two Alsatians and the gathering gloom meant we headed back to the car. Raymond didn’t put a name to it, no iPhones in those their days, but we raced back to Raymond’s house where he had a couple of American Field Guides and a quick look at the sparrow page provided the answer. It was a White-throated Sparrow Zonotrichia albicollis all the way from America, sure you couldn’t beat that! I would like to say my drawings perfectly captured all the bird’s features allowing us to confirm the ID, but alas, I hadn’t included the small area of yellow just above the bill, the diagnostic feature! Fortunately Raymond had noted that and confident that we had correctly identified the bird we rang Tom Ennis who, after we had provided satisfactory answers to his questions, seemed happy to agree with our conclusion! The bird was present the next morning for the assembled crowd and stayed faithful to the general area to 14th April 1985 (Irish Birds 3(1): 120 & 3(2): 331), it was even heard to sing! Duncrue Street is adjacent to Belfast Port and it almost certainly had arrived on a fast container ship from the USA or Canada. Did that spoil the fun, no it didn’t! This was the first for Northern Ireland and only the second Irish record following an immature male at Coosaneska, Cape Clear Island, Cork on 3rd April 1967 (IBR 15: 42). Up to 31st December 2015 there has been one subsequent record on the Lighthouse Road, Cape Clear Island, Cork from 12th to 18th October 2008 (Irish Birds 9(1): 101). With thanks to Raymond Hume and to Tom Ennis for his pictures. A couple of pictures taken on 15th December 1984. White-throated Sparrow is one of five members of the New World genus Zonotrichia that includes White-crowned Sparrow Z. leucophrys, also on the Irish List. 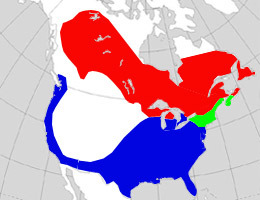 With the exception of the Neotropical Rufous-collared Sparrow Z. capensis they breed north of Mexico and all are migratory apart from some west coast populations of White-crowned Sparrow. In this part of the world they would be collectively known as buntings rather than sparrows as they are members of the family Emberizidae rather than the Passeridae. 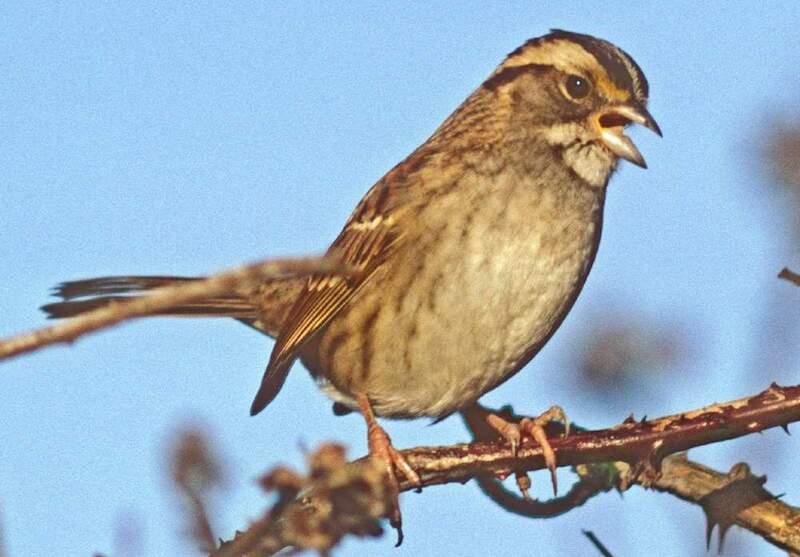 The Zonotrichia are medium to large sized sparrows with large conical bills that breed at the edges of woodlands or in areas of tall shrubs, although White-throated Sparrow may sometimes nest in dense woodland. White-throated Sparrow is a vagrant to the Western Palearctic, most often in spring. As of summer 2016 there are approximately 70 WP records, including 48 in Britain. The first WP record was in early January 1893 at Holderness House, Hull, East Yorkshire, England that was shot on the following 13th February. This record was not accepted by the BOURC until October 2010.